← Why Did Friends Go Crazy Over Potato Eggplant Curry? It’s partly cloudy this summer morning, with a good chance of thunderstorms later. You got up before the sun and before me, let the dogs out, cleaned up where the cat had thrown up, and came back to the bedroom. I was lying awake in bed thinking about writing this blog post and cuddling with the cat. “Happy anniversary!” you said and we smiled at each other. You might have curled back up with me for a sweet moment but the cat had staked her claim and was glowering at you. Besides, you had the teakettle on. 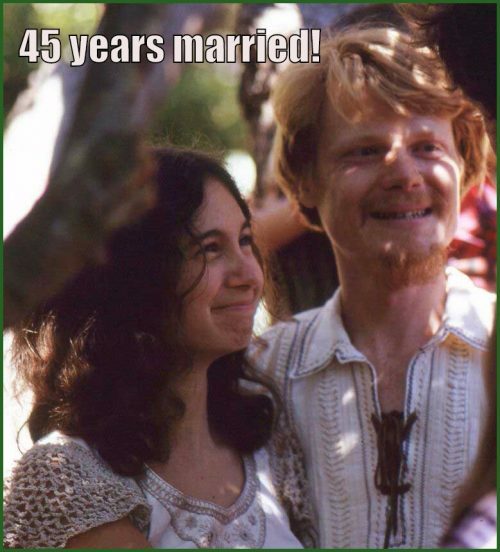 Let’s see, 45 years is over 16,000 days, plus it was about a year and a half living together before our hippie wedding. That’s a lot of time to stay in love but we have. I still think you’re fascinating and darling and good company. And I want to shout my love for you to the rooftops because we are so lucky or maybe I should say blessed. I often feel so rich though it certainly isn’t in monetary terms compared to national averages. 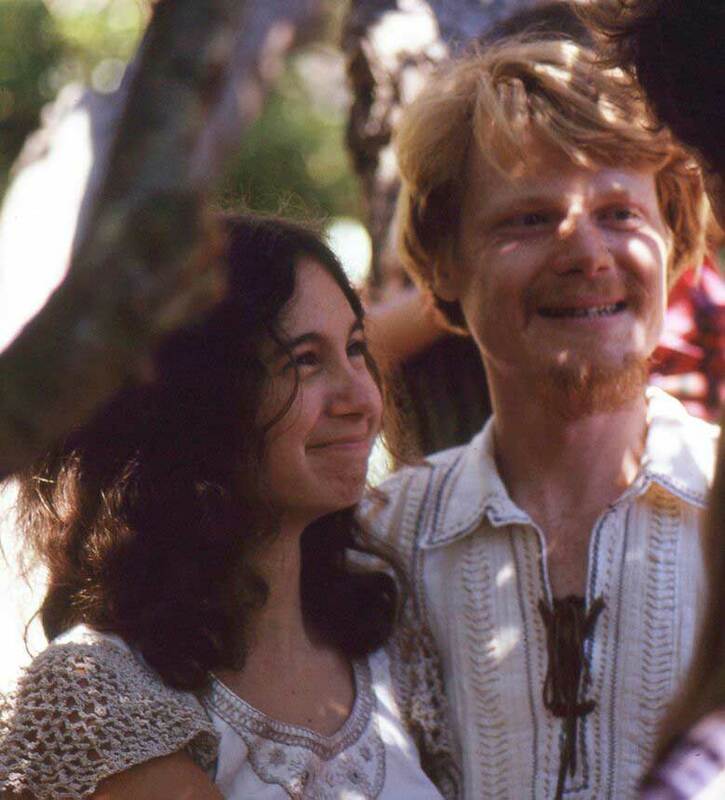 But one of the things that intrigued me about you from the day I visited you in your school bus home on the California coast was how you lived so much outside the money economy, with your big garden and your alternative housing. I have often wondered why our marriage has lasted when those of so many friends and family members have not. We saw some of those other marriages end after they became open marriages. I remember a conversation you and I had in the car one day, driving from Sunshine Camp, where we lived with family members in Forestville, California, to Sebastopol, where I ran the public library. You were about to drop me off at work and then do some errands. We would have been in our early 30s then. We admitted to each other that we were sometimes attracted to other people. I was thinking of a particular dark-haired writer who frequented the library, and I didn’t want to know who you might be thinking of. But we agreed that we didn’t want to risk losing what we had together. We didn’t risk it. We didn’t have kids together, and that was another factor. With your daughter Ajila an adorable two and a half when we met, I got a crash course in how much time and energy it took to raise kids. I’ve never had a lot of energy… well, I sometimes do but then I get exhausted, a lifelong pattern. Combining having Ajila with us at times with my fatigue and our mutual concern about world population (yes, even back then), we both came to feel that raising one part-time kid to the best of our ability was plenty. It’s not that we always got along blissfully. Remember the spring day when I was so mad at you that I threw your shirt on top of one of those huge California poison oak thickets? And there it remained as long as we lived there, an irretrievable reminder of my temper. Why irretrievable? Because I got really, really bad cases of poison oak. One time a few years later I was ranting furiously at you about something and you broke my train of thought to ask, “Are you about to get your period?” I was but I yelled, “That has nothing to do with it!” Of course it had everything to do with it. It’s true, we are patient with each other, despite our differences. You had a delicious intensity to you, and that came out as focused on your projects. I love that, and I am far more scattered, with interests going in so many directions that I don’t have the time I want for any one. You had dropped out of college, while I had graduated from Stanford with honors. Hmm, guess that’s one time I wasn’t so scattered. You have always been independent in your thinking and actions, where I’m more social and admittedly a bit more conventional. Not that I’m really conventional… as I was growing up, in my family to call someone “normal” was not praise. I joined you in the bus you were living in when we fell in love. That was in Jenner on the northern California coast. A few years later, we moved inland when we bought Sunshine Camp with two of your sisters and their husbands. You and I bought 70 acres in the mountains outside Ashland, Oregon, and we got into raising llamas there. I wrote Living with Llamas and you produced some videos on how to raise llamas, and thus began our media empire! Once the internet came along, we were early adopters. Creating books and videos became our bread and butter, augmented as needed with library work and the carpentry you did. One time, I ran the ranch alone for a bit, not easy for me as you were (and are) the one with good skills in physical reality. But you had a strong desire to make a difference in the larger world. You went to the Soviet Union with an Earthstewards group. You came back with video you’d shot that became two programs, a deep and poetic one called Reflections: The Soviet Union with Hart and the other for the educational market. That second one really took off and sold hundreds of copies. I was so proud of you for both of them. After a small plane crashed on our land there at the Siskiyou Summit, killing the pilot, and another one crashed nearby, and there was a forest fire down the hill from us, we began to think we were living on a power spot. After much inner searching, we gave up Juniper Ridge and the llamas, well, we worked out a boarding arrangement for the llamas with some good friends. Then later after the sadness of not living with llamas had softened, our friends bought us out. Moving into a house in Ashland gave us more freedom to travel, and we went to Mexico and produced a couple of educational videos. Later, we moved to Olympia, Washington, remember our mixed feelings about moving? But it seemed to be our path. Later, you outfitted a bus and we roamed the west and settled in Crestone, Colorado, where you built that artistic earthbag house. Later we lived in Mexico for 5 years, went back to Crestone, moved again last year to Silver City, NM. Are we done moving around? Who knows? So now we are in our early 70s and I guess you could say we are getting older together. Sometimes I worry about what life would be like if I outlived you. But really I rarely think about it, and when I do I remember what happened when we were living in Mexico, hmm, I guess it’s over 10 years ago now. For once, I knew exactly what to do. Feeling extremely calm, I told you to stop saying that and to pay attention to your breathing. I told you to breathe in the healing energy that is always around us, which comes from God. For once, you immediately did what I suggested. As you grew quieter, I felt engulfed in love. Partly it was huge gratitude for our years together and party it was an inner knowing that no matter what happened with your body, it would be okay somehow. In that moment I knew the love as a gift from God. The realtor asked if he should call an ambulance. You said no and I said yes. He called the ambulance, and as you remember as well as I do, you got out of that episode with a couple of cracked ribs. Anyway, that is just one of our many tales of life together. Let’s go out to lunch and reminisce some more. When was it that you were on a Bay Area list of “creative and extraordinary” people? And of course we always like to talk about our dogs over the years, Martha, Cider, Teddy Bear, Dorrie, Sunbeam, LarryDog, and the two with us still, Lola and Nicky. Maybe I’d better get going on those memoirs I sometimes want to write. Thanks, Elizabeth! You know us pretty well from Colorado but we ain’t saints! you two are SOOOOO sweet! Thanks, Emma! Still remember meeting you in the bus! I think you know what you’re saying! Thanks, Rebecca! You’re one of the few people who would recognize the photo as us!